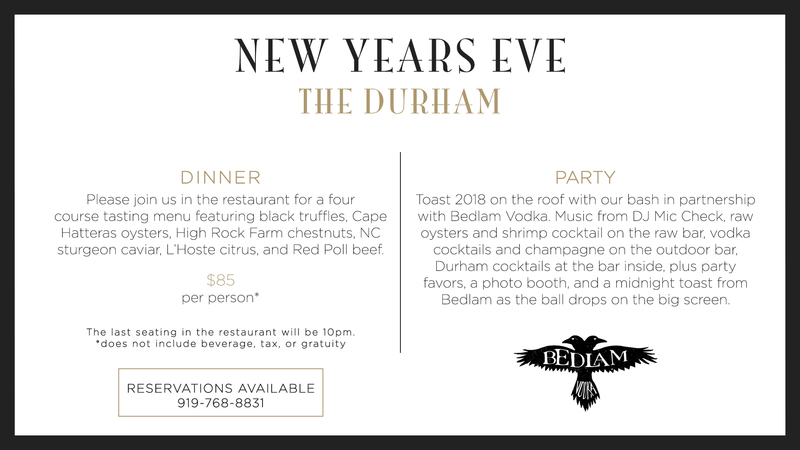 Ring in the New Year with a 4-course dinner in the restaurant, or music from DJ Mic Check, party favors, a shrimp cocktail & oyster bar, and a midnight toast from Bedlam Vodka on the roof. Reservations at 919-768-8831 or online at opentable.com. This year, we’re partnering with Bedlam Vodka for our rooftop bash. Music from DJ Mic Check, raw NC oysters and shrimp cocktail on the raw bar, vodka cocktails and champagne on the outdoor bar, Durham cocktails at the bar inside, plus party favors, a photo booth, and a midnight toast from Bedlam as the ball drops on the big screen. No cover. Entry is first come, first served. Space is limited, so come early! The roof opens at 4; Bedlam party at 9. The roof is heated and enclosed.